While I’m not necessarily in a rush to get rid of the stock bulbs just yet, I figured it wouldn’t hurt to put in the time to figure out what’s going on in the vehicle. For that, I need to know the actual bulbs that I have inside my head lights and tail lights. I started with the tail lights because the few pages I saw online suggested that getting the tail lights out was actually pretty trivial. I can use the information I gained from doing this to plan what bulbs I’ll want to get when it comes time to upgrade. 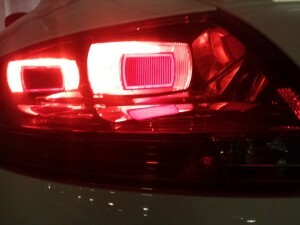 Unlike my old BMW, to switch the bulbs in the tail lights you actually need to totally remove the light. 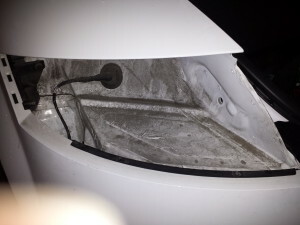 When I switched my rear blinkers in my BMW, I could just remove some of the liner in the trunk and I had access to the bulbs. 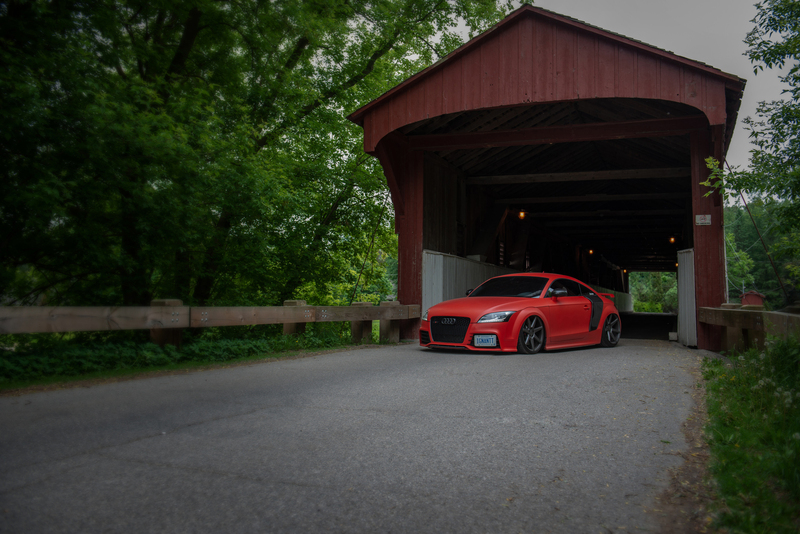 This was a bit different but Audi still made it easy. To start, you need to get in the trunk and slide back the floor of the trunk. Coincidentally, all the tools you need should be *right* there. I was pleasantly surprised that I didn’t need to go digging for some fancy tool set. Thanks Audi! 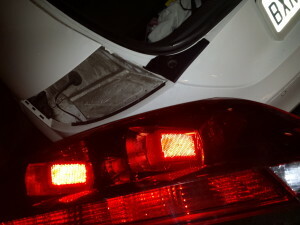 I only needed to check out one of my tail lights, so I chose the driver side. There’s a little circular tab in the trunk liner, so I picked a screw driver that was in my trunk and popped it out. It stayed connected on one side, so I made sure not to pull to hard or anything on it. Once the tab is popped back, if you poke around in there you’ll find a little plastic piece. 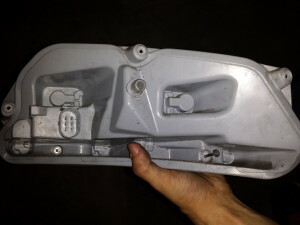 Either it’s an incredible coincidence or Audi is thoughtful… but there’s a plastic handle in the trunk as well that just so happens to fit right into that plastic piece. I stuck it in and started spinning counter-clockwise to unscrew the plastic piece that holds the light in. 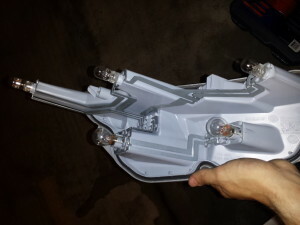 Once the plastic piece came out, the light housing was essentially just floating in place and plugged in. There was a bit of jiggle to get it out, but once it was out of the car, I just needed to unplug the one cable that ran to the housing. Easy. Once you’re holding the housing, there’s only a few more screws to go. 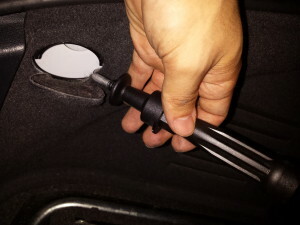 Again, I just leveraged one of the screw driver heads inside of the trunk and fit it right into the plastic handle that I used to unscrew the black plastic holding in the light. I couldn’t get over how convenient it was. 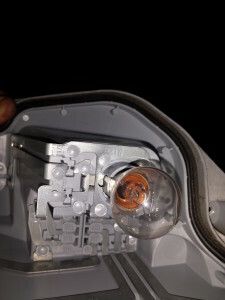 There should be five screws holding the plastic cover onto the rest of the lighting housing, and once you unscrew them the two pieces should come right apart. I had thought they only used a single bulb for the entire strip on the bottom and had a creative way to diffuse the light. I guess not though. 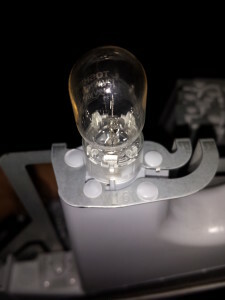 More convenience though… the bulb information is directly at the base of the bulb. Once I had all of this information, jotted down (and the pictures taken so I could document it all in this post) I had to put it back together. I put the five screws back in to get the housing back together, and then I connected the single housing cable back on. The trouble I ran into was actually putting the light back into the vehicle, and I got a little bit nervous working through it. The way I finally got it to work was starting toward the inside of the vehicle and hooking the rubbery liner onto the car. 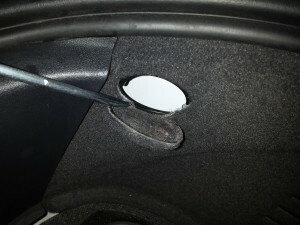 Once that was in place, I had to pull back and out on the light to get a tiny little round tab to fit into a groove on the car. I never noticed this while taking it out. It took several attempts, but once I realized that I really had to give it a pull, it went back in smoothly. With the information I found out, I decided to google a little bit to look for various parts for the W16W and P21W bulb models. I haven’t done any bulb swaps before, so I was pretty overwhelmed when I saw an incredible number of numbers and specs pop up and nothing seemed to really indicate exact support for W16W or P21W. This likely isn’t news to anyone who has done bulb replacements in their vehicle, but it was certainly news for me. When I swapped the lights in my BMW, I only looked up compatible halos and known compatible signal kits. When searching for Audi TT RS components, it seems slightly more limited int the information available on the Internet. So, with that said, I hope you learned a little bit!